Professional social network LinkedIn has long had a feature that lets users update their status on their profile. But it’s plainly obvious that LinkedIn users don’t nearly use the status feature for mass communication as frequently as they use Twitter or Facebook for the same purpose. In fact, I surveyed a sampling of LinkedIn users who avidly use the site for networking but never update their status on their profile. Many didn’t even know that LinkedIn had a status update feature. Starting tonight, LinkedIn will integrate with Twitter, letting users sync their LinkedIn and Twitter accounts to broadcast LinkedIn status updates on Twitter and vice versa in real-time. So how does this work? LinkedIn will now allow you to update your status on your LinkedIn profile and then share the message automatically to Twitter. To enable to enable the cross posting feature, you just need to click the new Twitter box under your Network Updates box on the homepage and sync with your Twitter account (via oAuth). The integration works the other way as well. 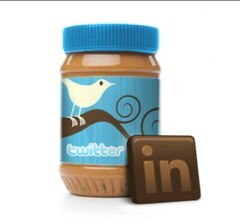 You can also share Tweets to your LinkedIn profile from Twitter or any other client by adding the hashtag “#in” or “li”. As part of the setup process on LinkedIn, you can choose to either send all your tweets or select tweets that have the hashtag “in” from Twitter back to LinkedIn as a status update. You can also import your Twitter stream into your profile now, which is also an op-in feature. So your profile will show a “Recent Tweets” section that will include a real-time stream of your Tweets. The ability to show your Twitter stream in your LinkedIn profile no doubt provides a compelling social media context to your professional CV. 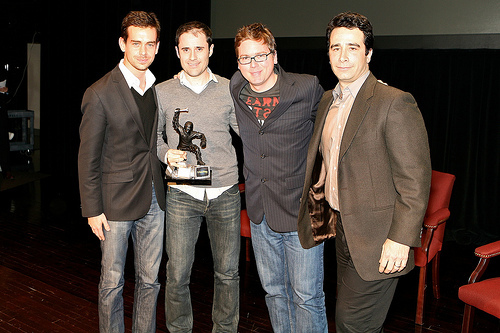 As Twitter co-founder Biz Stone says in a video about the harmonious integration, “the business use case of Twitter is turning out to be very important.” He adds, “The persona they create for themselves on the web is part of their resume.” Stone also said LinkedIn and Twitter are as complimentary as “peanut butter and chocolate” (hence the logo). It makes sense for LinkedIn to integrate with Twitter considering that its own status update feature isn’t tremendously popular. The ability to Tweet directly to your LinkedIn profile will add a good amount of fresh content and perhaps new traffic to the site for social purposes as well as for professional interests. And perhaps the Twitter integration will breathe new life to LinkedIn’s status update feature. AIM and MySpace also made similar moves by adding the two-way sync with Twitter. As my colleague Erick Schonfeld eloquently wrote recently, LinkedIn, like other social media sites and networks, is realizing that it’s better to swim with the stream than against it. Blue says that for now, LinkedIn is concentrating its efforts on Twitter thanks to the “great amount of business conversations” that are taking place on the microblogging platform. But LinkedIn’s other founder and executive chairman Reid Hoffman, who recently joined VC firm Greylock as a partner, was an angel investor in Facebook, so it would make sense LinkedIn will play nice with Facebook in the future. When asked about the possibility of a URL shortener being added to LinkedIn’s status update feature (which would be useful given the integration with Twitter), LinkedIn spokesperson Kay Luo said that would make a lot of sense and could be a possible addition in the future. Luo declined to say whether LinkedIn will be creating their own URL shortener or integrating with one of the billion other shorteners out there. LinkedIn is no doubt growing, reaching 50 million users a few weeks ago and innovative features like this should only add to the social network’s popularity. And as Twitter continues to globally, this will compliment LinkedIn’s considerable international presence. It’s important to note the Twitter feature will be gradually rolled out over the next 24 hours to all LinkedIn users.